Persistent arthritis is a very common problem of the modern civilization. An inactive lifestyle, physical overload and unhealthy diet are common causes of arthritis. To prevent them, keep your joints healthy from an early age. Well-established habits can determine the greater endurance of our joints and prevent many painful ailments. Remember that following a few tips can be both effective prevention and real regeneration of diagnosed arthritis. The joints are movable connections between the bones, respectively adjusted to each other. The cause of most joint diseases and rheumatic diseases is cartilage damage. The cartilage tissue has a soft structure and protects the face of the bone from friction and abrasion, and also cushions their movement. Cartilage consists of molecules that have the unique ability to bind water, so it has a very flexible structure. Over time, the condition of the cartilage gets worse, which directly affects arthritis problems. In addition, an abnormal diet, body overload, inappropriate physical activity, and intensive pharmacotherapy can cause many disorders in the functioning of the joints. Actively practicing sports is a great support for joints and the spine. Even moderate physical activity can increase the volume of cartilage tissue, which directly affects greater secretion of joints into the joint cavity. As a result, the joints become more efficient and their blood supply and oxygenation are improved, which significantly alleviates joint damage. Increased joint mobility better stabilizes bone joints and lessens the perceived pain. Numerous studies of patients complaining about joint ailments confirm that regular physical activity shortens painful attacks that result from inflammation of the joints. Regardless of what form of exercise you choose, be sure to do a proper warm-up, which will consist of non-weighted stretching exercises. Individuals suffering from chronic arthritis should consult the scope of exercises performed with a doctor. Improper selection of physical activity can adversely affect a patient's condition by worsening the condition. The optimal solution is to perform exercises under the supervision of a rehabilitator who was previously informed about a patient's arthritic condition. Maintaining proper body weight is of great importance for the proper functioning of the joints. Proper body weight causes that on one hand, the bones are not overloaded. On the other hand, maintaining the right balance facilitates the performing systematic physical activity, very important for maintaining good joint health. Obesity is one of the most common causes of the risk of osteoarthritis of the knee, hip and even joints of the hands. Research of those who have been diagnosed with arthritis show a clear relationship between body weight and joint condition. Overloading the joints, which results from high body weight, adversely affects their condition. Excess weight causes the joints to be overloaded, leading to mechanical damage to articular cartilage. At this stage very often there are symptoms such as pain and stiffness of the joints. Our lifestyle, to a large extent, determines the condition of the joints. Both professional work and the activities that we undertake in our free time may adversely affect our bone-joint system. Employees who perform specific occupations such as hairdressers, athletes, people working long hours on the computer or physical workers are very exposed to specific joint ailments. High repetition of specific movements and overloads of the same part of the body, greatly affect the condition of the joints. That is why it is so important to respect health and safety at work and care for ergonomics at the workplace. Very often during domestic activities such as cleaning, window cleaning, dusting, we do not wonder if the position will not adversely affect the condition of the joints. Sadly, many of the habits deteriorate their condition. Carrying heavy shopping in one bag, a hunched posture while watching TV, carrying heavy bags - these are just some examples of activities that burden our joints. Remember that many arthritic ailments that arise in old age are due to improper habits and lack of care in earlier years of our lives. Therefore, no matter what work you do, remember to relieve the joints. A proper diet has a huge effect on good joint health. Keep in mind that many nutrients have a positive effect on muscle, joint and bone strength. On the other hand, many products can act destructively, significantly worsening the condition of our body. To maintain healthy bones, you should prepare a diet rich in nutrients that not only improves arthritis but also relieve symptoms such as pain or joint stiffness. A diet designed for people suffering from rheumatoid arthritis (RA) should be rich in omega-3s, protein, and vitamins D and C. Omega-3 fatty acids are extremely beneficial for rheumatoid arthritis. Products rich in omega-3 acids are primarily sea fish, seafood, nuts, and almonds. Protein is one of the main ingredients that build articular cartilage. Let's remember to choose these protein products that will not cause a large increase in weight. Speaking of protein, it is impossible not to mention the collagen that determines flexibility and joint strength. An extremely important component of a diet designed for people with arthritic conditions is vitamin D, whose biggest quantities are provided by the sun. Sun deficiency can also be supplemented with nutrients such as eel, herring, mackerel and yolk. Vitamin D strengthens the bones and prevents the formation of osteoporosis. It results in a uniform bone load and prevents arthralgia. Stress triggers many autoimmune diseases. A very common symptom of prolonged stressful situations is the occurrence of diseases such as - rheumatoid arthritis (RA) or colitis. The stressed body produces large amounts of cortisol. This reduces the body's sensitivity to this hormone, so the immune system is in constant readiness for the immune response. The organism fights with its own tissues and weakens its immunity. In addition, stress causes long-lasting muscle tension, which affects the fascia and tendon stiffening. As a result, changes in the bone-joint system occur. High muscle tension resulting from a persistent high level of stress leads to overloading of the joints. Due to the tremendous amount of domestic and professional duties we have to complete every day, we often forget about the necessary physical exercise and proper rest. Stress-induced muscle tension can be manifested by, for example, contracture of the arms or tension of the facial muscles. You should not underestimate the first symptoms that could lead to very serious arthritis in the future. To prevent this, regular muscle relaxation should be undertaken, either through appropriate physical exercise or through relaxation techniques. Reducing muscle tension will release our joints from unnecessary overloads and will help them stay in a better condition. A wide selection of footwear, from comfortable sports shoes, popular sneakers, moccasins, classic shoes to heels that are uncomfortable and detrimental to our foot, gives us tremendous opportunities for effective prevention for healthy joints. Proper foot placement is important for good knee and hip health. An appropriate selection of shoes is a matter that is very often underestimated by us. We don't appreciate the tremendous impact of footwear on joint health and posture. Particular attention should be paid to the height of the heels. Too high heels can cause discomfort such as transverse flat feet and the appearance of lumbar toes. Proper footwear should be suitably broad. It is also important that the tips of the shoes are comfortable and the height of the heels does not exceed 3 cm. Our body has been equipped with its own cushioning mechanisms - joints and muscles. The level of cushioning required during movement depends largely on the fitness of our joints and muscles. Persons with high efficiency of these systems and proper weight can choose shoes with low depreciation. People who are overweight or with severe arthritis should ensure maximum cushioning by choosing the right footwear. The selection of shoes is a very important part of taking care of healthy joints. It should be kept in mind not only when doing physical activity (jogging, Nordic walking), but also on a daily basis when performing routine activities. HOW TO SELECT FOOTWEAR FOR A PHYSICAL ACTIVITY? The arrangement of the foot determines the alignment of the knee, hip, pelvis and spine axis. Proper shoe selection not only enhances the comfort of exercising but also promotes proper joint health. During running, the foot should be placed as neutral as possible on the ground. Then the forces that push on the bones and the joints are transferred to the runner's advantage - running is effective and not tiring. Arthritis is often mistakenly identified with an older age. Unfortunately, an unhealthy lifestyle, occupational work, or abnormal eating habits can cause troublesome arthritis problems at every age of our lives. 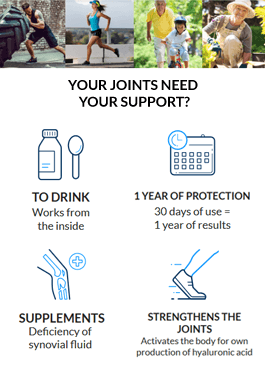 Prophylactic measures such as increased physical activity, nutritional nutrients and a reduction of excessive weight should be used to maintain high joint efficiency. Is there an effective method of joint regeneration? Definitely yes. It is the right dietary supplement. Very good results are proved by including a preparation that contains all the necessary ingredients needed to rebuild the cartilage and synovial fluid. In order to regenerate the joints, the body needs to be provided with a proper proportion of hyaluronic acid and chondroitin sulfate. Hyaluronic acid replenishes synovial fluid deficiency and improves joint mobility. Chondroitin sulfate, on the other hand, affects tissue elasticity and promotes cartilage regeneration. Hyalutidin HC Aktiv contains the optimal combination of these two ingredients, making the preparation extremely effective in regenerating and strengthening the joints. The liquid form of the preparation makes it use easier, so you can forget ailments conected to painful joints and finally start enjoying active life.